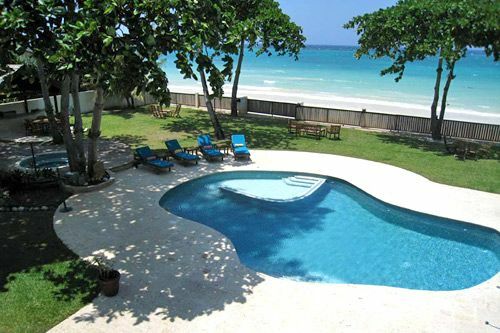 Just west of Ocho Rios, a small lane leads to a brilliant oceanfront villa. An electronic gate opens to reveal the large and splendid private home named Malatai. Stately lions, koi and lily ponds grace the covered entrance. On textures of gleaming Jotoba wood, Italian tile, Jerusalem stone, marble and granite, interior spaces open to the piece de resistance: a 3,300-square-foot sugary white sand beach. Directly on the turquoise waters of Old Fort Bay in St. Ann‘s Parish, Malatai is one of the largest villas in this collection. The free-form pool includes a shallow children’s section, separated from the deeper pool by an underwater partition. The overall property consists of the spacious main villa, separate air-conditioned fitness cottage, hot tub, large lawn with shaded sitting areas, and teak party deck with barbeque for outdoor entertaining by the sea. Beyond the lawn is the lovely white beach and excellent swimming water. Four single and four double kayaks and are complimentary. Life vests are also provided for both adults and children. A long fence privatizes the pool and lawn. The fence is designed to be rolled open each morning to reveal a gorgeous all-day panorama of the beach and blue sea just steps across the soft grassy lawn. Day and night, the sounds of the sea echo the romance of this idyllic location. From the state-of-the-art tile, stainless steel and granite kitchen, home-cooked meals are served in the inside dining room or on the al fresco verandah. Two Swiss-made coffee machines provide all-day on-demand rich fresh-ground Blue Mountain coffee. Signature drinks and hors d’oeuvres are offered each evening around the verandah bar. As a special treat, the butler will hire a mento band and plan a torchlight beach party with jerk chicken and pork, tenderloin, kabobs, or fresh fish or lobster served sizzling from the outdoor grill. On request, the butler can arrange for jet skis, water skis, parasailing, windsurfing and a sunset cruise boat to be delivered to the Malatai beach. The staff can also arrange yoga instruction and spa treatments at the villa. While privately located, Malatai is only minutes from Dolphin Cove, famous Dunn‘s River Falls and lively Ocho Rios with its wide selection of duty-free shopping, excursions and music.